(SPOILERS) Movies, let alone horror movies, with a satirical edge are few and far between, so when one comes along and delivers on the thrills and scares, it’s nigh on a minor miracle. 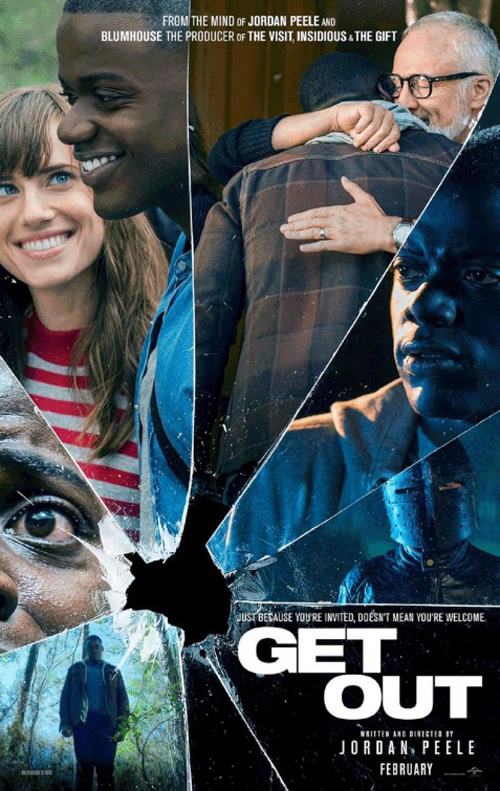 I purposefully stayed as spoiler-free as I could for Get Out, which is undoubtedly a key to its effectiveness – the trailer is shockingly remiss in that regard, and I’m glad I didn’t watch it first – but even more so is how deftly observed and layered debut director Jordan Peele’s screenplay is (as a director, meanwhile, he has the confidence of one who’s been doing this for years). The beginning of the year gave us a movie with a leftfield twist in Split, and Get Out offers one that goes even further; there’s a leap required here, undoubtedly, and if it isn’t perhaps the most elegantly conceived of metaphors, it is one that’s rigorously sustained, and Peele brings events to such a rousingly cathartic conclusion that any misgivings seem almost churlish. Peele is clearly well-versed in horror fare, but it’s only at the point of his lurch into mad scientist territory that Get Out feels as if it’s overtly relying on the genre for props. Other elements brush up against recognisable set ups, from the dinner party from hell (the recent, very good, The Invitation did the same, and notably also opened with its en route protagonists portentously hitting a deer) by way of Guess Who’s Coming to Dinner, to the claustrophobic, isolated community or environment from which there is no escape, one that seems to close inexorably around its lead character (The Wicker Man, Kill List), to the detectives humouring a legitimate crier of wolf with his tall tale (The Terminator), to the Kubrickian design of the conditioning room, to the concept of the Sunken Place (its visual cues can be found in everything from Dust Devil to Under the Skin). And even then, he just about gets away with it, thanks to laying the groundwork with an almost as eccentric trope, that of the all-powerful hypnotist (Catherine Keener’s performance as matriarch Rose Armitage might be the most unsettling in the movie, all steely certainty and invasive assuredness, but I’m nevertheless unconvinced that anyone could be hypnotised by something as annoying as scraping a spoon around a teacup, any more than scratching nails down a blackboard). And the reveal itself, that the black staff, whom we (and very vocally, LilRel Howery’s welcome comic relief sidekick Rod, whose presence is much needed for sporadic defusing of tension) have assumed to be brainwashed abductees, are inhabited by the essences of the elder Armitages causes significant backflips in reinterpreting what we have seen. We thought we were simply back in Driving Miss Daisy territory, with much of the preceding picture doing a merciless job in exposing the prejudices lurking beneath white liberal inclusiveness, but the appropriation of their actual bodies, an additional layer of enslavement, adds an effective twist (as well as offering a take on those who would “lose” or bury their blackness). Running through this, beyond black being “fashionable now”, is an envy of perceived physicality, virility and creativity. The grandfather, who was beaten to the 1936 Olympics by Jesse Owens (“He almost got over it”), now races around the grounds at night, because he can, while Stephen Root’s art dealer believes occupying Chris’s body will furnish him with the talent he lacked as a photographer when he was still sighted. Admittedly, some of Peele’s conceits don’t quite translate; we see Andrew (Lakeith Stanfield) abducted by Jeremy Armitage (Caleb Landry Jones, doing one of his customary bizarro performances; he’s much more effective in the recent War on Everyone, but he’s certainly occupying a niche) in the first scene without any particular delicacy, so the pains the household go to in entertaining Daniel Kaluuya’s Chris seem slightly superfluous. There’s also a vague disconnect in motivation; if these rich white folks see their victims from such a superior position, would they really want to take possession of them, even given they are seen as disposable (it’s unclear if they would be as willing to prey on white people, although Root’s character professes as much)? Although, it’s often the case that, where one attempts to chart consistency in movie metaphors, they don’t entirely follow through. And there is a vague feeling, given how well-observed it is before we discover the extent of its Stepford Wives plot, that the picture might have been even more successful had it remained more grounded (simply because the observation is so strong up to that point). The final stages, as Chris fights back, are enormously satisfying, all the more so because of the entirely capable way in which he goes about it. I feared half an hour of hide and seek, but he’s braining and running through (with deer antlers) and stabbing and braining some more with no-nonsense aplomb. That the picture also ends on a victorious note, having faked us out with the more probable outcome, is also a key to its success. Peele apparently filmed another, more downbeat ending, but like Heathers I don’t necessarily think it needed underlining. We all know what the reality would be, and Get Out’s genre trappings have already made abundantly clear it isn’t that. Hence Armond White’s review, one of the few negatives, accusing Peele of “Reducing racial politics to trite horror comedy, it’s an Obama movie for Tarantino fans”. I can see what he’s saying here – although some of his comments along the way had me raising my eyebrows, not least his baffling celebration of recent Eddie Murphy movies – as there’s something of a pop-disposability about its packaging, but that doesn’t make the picture any less insightful. 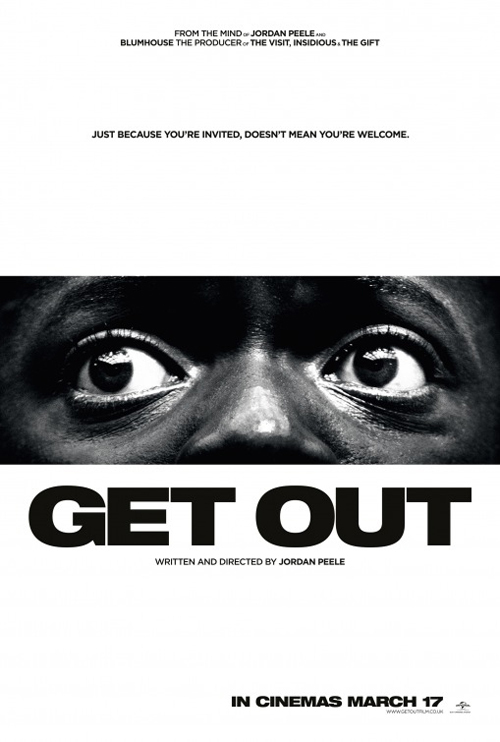 Yes, Get Out’s a picture that delves into racial politics in a manner that won’t, for all its acuteness, make most white audience members wretchedly uncomfortable (because its immediate targets are the affluent untouchables, and one can profess remove from such social bracketing), but the workings of Peele’s theme, that “The movie was meant to reveal that there’s this monster of racism lurking underneath seemingly innocent conversations and situations” are instantly recognisable. From Dean’s (Bradley Whitford) oft-quoted line about how he would have voted for Obama for a third term to his excruciating, ingratiating “My man” address, Peele lays bare the minefield of presumed well-meaning conversation that reveals its own set of assumptions, prejudices and undercurrents. This is a picture with too much going on to pick up from a single viewing, indicative of how meticulous Peele’s writing is. Just on a symbolic level, particularly cunning is that Chris is picking cotton (from the chair he is bound to) in order to gain his freedom. Both leads, Kaluuya (who I first really noticed in the sadly-cancelled-after-one-season The Fades) and Allison Williams, deliver fine performances. The reveal of Rose, even though we know it’s coming (the handy box of photos is perhaps a too familiar device, albeit undoubtedly works as part of the escalation), is a masterfully staged and acted moment. Jordan Peele’s movie has done huge business in America, and if it looks unlikely to replicate that internationally, as Blumhouse’s other big hit this year Split has done, it surely represents the pinnacle of the horror house’s output thus far, so the overwhelming critical kudos are probably more than enough compensation.